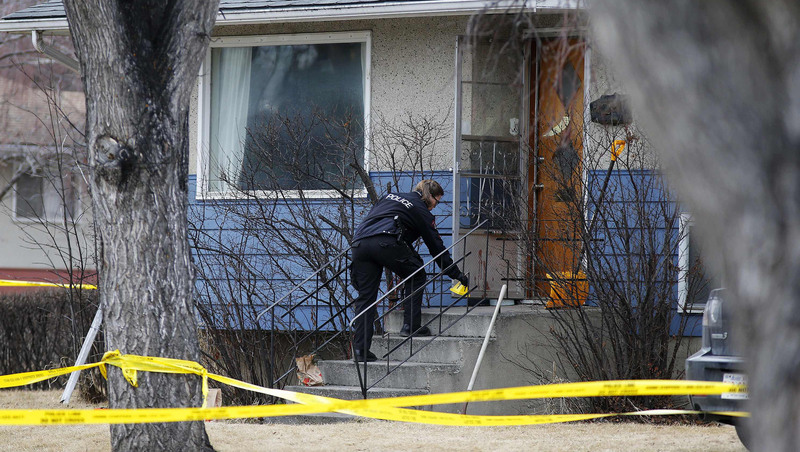 CALGARY, Alberta - A University of Calgary student was charged in the fatal stabbing of five people at a house party Tuesday that the police chief called the worst mass slaying in the western Canadian city's history. "This is the worst murder - mass murder - in Calgary's history," Hanson said at a news conference Tuesday. "We have never seen five people killed by an individual at one scene. The scene was horrific." The attack in the western Canadian city came nearly a week after a teenage boy in the U.S. stabbed and wounded 21 students at his high school outside Pittsburgh. Hanson said the motive for the Calgary attack was unknown. He said the suspect's father and mother are devastated. "They are now feeling so much sorrow," he said. "Those young people are dead and they are absolutely devastated." Hanson said the identities of the five victims - four men and a woman - will be released when autopsies are completed. He said their ages range from 22 to 27 and they were all "good kids." Neither the victims nor the suspect had any prior involvement with police, Hanson said. Hanson said about 20 people were at the party celebrating the last days of classes at a home in the northwest residential neighborhood of Brentwood, near the campus. He said the suspect was invited to the party and showed up after working his shift at a grocery story and was welcomed inside. He said it appears that no one at the party had been sleeping when the attack took place shortly after 1 a.m. Tuesday, but that everyone was taken by surprise. Hanson said the suspect "targeted the victims one by one, stabbing them several times." "Was there anything that precipitated the event? Was there something that anyone had done that anyone could have taken as an insult or an affront to this individual? To the best of our knowledge right now, there's nothing to indicate anything like that happened," Hanson said. Hanson said the suspect allegedly brought a weapon, or "instrument," from work to the party, but grabbed a large knife from inside the house. Three men were found dead at the home after someone at the party called the emergency dispatcher. A man and a woman died at a hospital. Police said de Grood was arrested with the help of the police canine unit about 40 minutes after the stabbings and was taken to a hospital for treatment for dog bites. Hanson said there's nothing to indicate the suspect was drunk or had been doing drugs. He said police are interviewing witnesses. The blue-sided house where the stabbings occurred is on a quiet, tree-lined residential street. It was surrounded with yellow police tape as medical examiner staff brought three bodies out on stretchers. Neighbor Doug Jones said about a dozen students had been drinking beer around a firepit in the backyard earlier in the night, but they weren't rowdy. He said they were talking about politics and the stock market. They took the party inside at about 9 p.m. and he heard nothing after that. Other residents in the area said the house party stemmed from the student union's annual Bermuda Shorts Day, which was held Monday. The event is an annual outdoor party on campus featuring live music and beer gardens to celebrate the end of classes. On Twitter, many students wrote about how they starting drinking Monday morning and, when the campus event ended in the afternoon, they continued at parties elsewhere. On Tuesday, about 500 students and faculty members attended a late afternoon vigil at the University of Calgary. With a candle projected on a giant screen, university president Elizabeth Cannon called for a moment of silence. "The world lost five bright, promising, beautiful young people," she said. "We are still coming to grips with this tragedy and what transpired. We don't know all the details and we don't know the full impact on our University of Calgary community." "Our community has been dealt a grievous blow. We've lost five young people, five good young people who did nothing wrong. Who like all of us had dreams and hopes and were building their lives," Nenshi said.